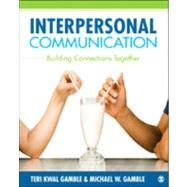 This text puts students at the center of studying interpersonal communication by shedding new light on their everyday interactions and relationships through an applied/case-study approach. With an emphasis on concepts and experiences relevant to students, this text considers in each chapter how media and technology affect the dynamics of relationships and self-expression. The authors also focus on diversity and developing cultural understanding through explorations in every chapter of how gender and culture help shape experiences of interpersonal communication. Interactive pedagogical features throughout the text, including chapter opening self-assessments, text boxes, pop culture examples, narratives, and discussion questions, are designed to promote self-reflection and enhance students' skills to communicate interpersonally.